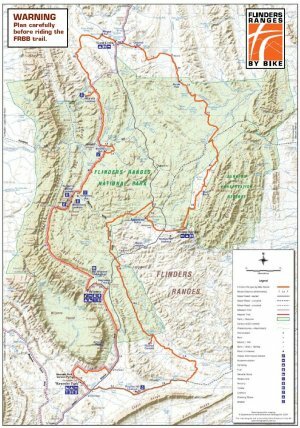 The “Flinders Ranges by Bike” (FRBB) cycle trail is a 200km circuit that links Rawnsley Park (Wilpena Pound) in the south to Gum Creek Station (Blinman) in the north. It follows part of the Mawson Trail as well as tracks on Arkapena, Upalinna, Willow Springs and Gum Creek Station Properties and within the Flinders Ranges National Park. The route is moslty on 4WD tracks with some dirt road sections and some single track sections. This trail is in a remote area and largely on private land that is not open to the public, contact Rawnsley Park Station to arrange access. Yes: Trail map is available from Rawnsley Park Station. The trail can be completed over several days with overnight accommodation available on route at Gum Creek Station and Willows Springs Station along with Rawnsley Park and Wilpena Pound. There are no map boards on route. Escapegoat Adventures offer supported tours of Flinders Ranges by Bike trail. The Flinders Ranges by Bike trail is the home of the annual Flinders Ranges Outback Epic that was inaugurated in 2013. The FRBB trail is maintained by an association of Station Owners (Flinders Ranges by Bike Inc.) with the cooperation of the Department of Environment and Heritage. Video: Flinders Ranges by Bike video from Escapegoat Adventures.